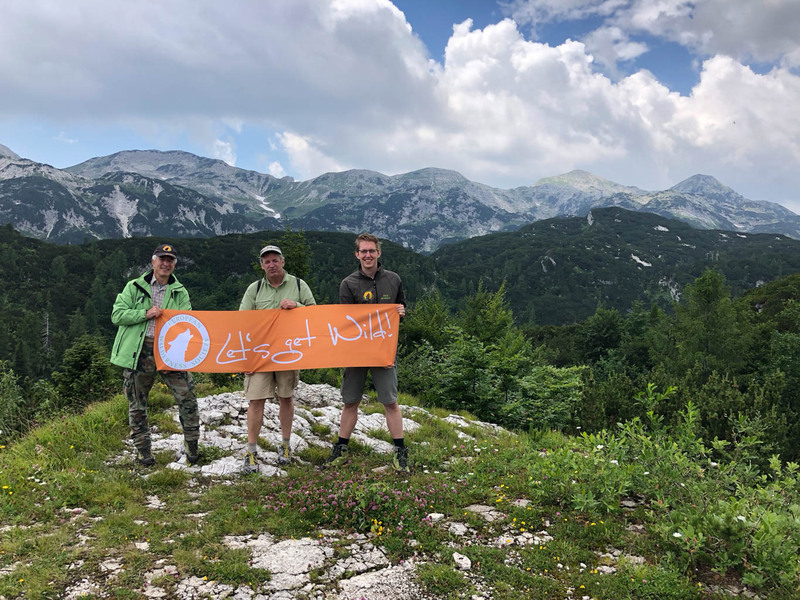 Last weekend, our Wilderness team visited Triglav National Park in Slovenia, together with Garry Oye, former Chief of Wilderness Stewardship Division of the United States. Triglav National Park is the only Slovenian National Park, located close to the Austrian and Italian borders. The Park is known for its wild valleys, conifer-filled mountain slopes, and barren peaks. It has a core zone, where there is (almost) no human impact. Every year, Triglav National Park welcomes several tens of thousands of visitors. Many visitors explore the Triglav Valley, next to Mount Triglav, the highest peak in the National Park. Our visit focused on the southern part of the proposed Wilderness zone in Triglav National Park, the Komna valley. Starting right at the border of the core zone, a path with almost 50 switchbacks takes you straight to the edge of the Komna valley. Along this path, you come across older and younger mixed forests with beech, ash and pine trees. At the edge we came across a big mountain hut, Dom na Komni, a refuge for many hikers. The hut has place for 106 visitor to stay the night. A small electric lift transports all goods up and down the slope. From Dom na Komni, there are several hiking routes to the western and northern part of the National Park’s core zone. Our Wilderness team continued further into the Komna Valley, where you can still find the remnants of a military camp from the first World War. Back in the days, the camp had 20 buildings, now only a handful remain. Our trail guided us to the mountain pass, named the Bogatin Saddle. Along the trail we encountered vast and wild fields of mountain pine, larch and alpine roses. The impressive diversity of flowers alongside the trail included several rare and protected species. At higher altitudes, old remnants of grazing activity is still visible. However, nature is reclaiming these lands at a fast rate and covering the once trampled grasslands. Finally, right at the Bogatin Saddle, a field of flowering Edelweiss welcomed us. The wild jungle of conifer forest, colour-rich fields of flowers, and snow-covered patches shows that humans let nature develop by herself. An inspiring example for Slovenia and other European countries. Concluding, our Wilderness team is convinced that the National Park’s core zone hold potential to become a Wilderness in the future. It seems that the mapping software is going through a GDPR-compatible update. Thank you for the notification, and enjoy your trip next week!